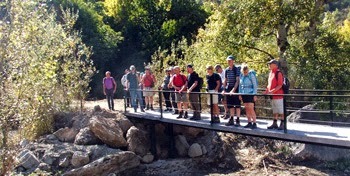 Walking and trekking holidays in the sierras of southern Spain with a qualified British mountain guide. Whilst walking this week it was a great surprise to see my first spring flower of the year. The actual species of this flower, a type of purple orchid was difficult to identify as it was only just emerging however it was a great sign of spring. The walk I was on was above Guajar Fondon in the Guajares valley which lies about 10 kilometres inland of Salobrena on Costa Tropical. Looking north from where I spotted the flower I could also see the high peaks of the Sierra Nevada still covered in snow where more alpine conditions were still in place. This early sign of spring is most pleasing as only the week before this sighting I was dealing with frozen pipes and snow on the ground at my finca above Lanjaron. We do get orchids on the hill side near us though I would not expect to see them until late May. This early sighting highlights the variation in the arrival of ‘’spring’’ here in southern Spain. Within our village it is easy to see by watching as the opening of the almond blossom advances up the mountainside. Lanjaron is at about 700m above sea level whilst my finca is 300m higher. Two weeks ago (early Feb,) the first blossom was opening in the village and it will take about another week to arrive at out height. Whilst it certainly doesn’t necessarily mean the total end of the cold none the less it’s a sign that warmer weather is on the way. As I write this we are once again in cloud and rain and I’m huddled over a gas fire. This variety in habitat and conditions is due in part to the relatively short distance from the sea to the summits of the mountain ranges. For example from Mulhacen, which at 3482 is the highest point in the Sierra Nevada and also the highest point in mainland Spain it is only 35km to the beaches of the Mediterranean. So you can travel from the Costa Tropical, were you can grow bananas, to an arctic tundra of ice and snow in a couple of hours drive (if you go to the ski village above Granada). The proximity of the mountains to the sea is perhaps most dramatic in the area around Nerja and Almunecar where the foothills rise almost from the waters edge. This variety, as well as giving us a massive range in habitats and conditions also means that for most of the year the choice for walking is equally vast, from dry desert valleys to alpine summits via pine forests, rolling pastoral hillsides and orchards, you can have it all. Despite the high temperatures of early July I thought I might get away with a walk along the verada de Estrella path on the north side of the Sierra Nevada. This route follows the line of an old mine access track as it follows the Rio Genil valley to the now disused workings. The walking starts after a dramatic drive east from the village of Guajar Sierra along a single track road through tunnels and cuttings along the route of a disused single track railway. The walking itself is fairly gentle through outcrops and crossing terraces as you traverse the valley side. The path eventually reaches the ruins of the mina de Estrella This is one of many mine workings in the area, in the 1940’s nine families lived at and worked this particular mine which was finally abandoned in 1957. The miners extracted metal ores including pyrite, fools gold as well as copper and iron ores. Quite often when walking there are moments when a breathtaking vista opens up as you crest a hillside or reach a particular spot. The Estrella path has one of those. The first part of the route runs east as it follows the river valley; whilst this is dramatic enough it is after about an hour when the valley turn south that the drama really begins. As the path passes through a rock cutting a spectacular view of the north faces of the 3,000m plus peaks of Alcazaba and Mulhacen towering nearly two kilometres above the valley is suddenly revealed. Even in July these mountain faces were flecked with snow. The first part of the walk was quite cool as it passed through patches of shade. At one point I thought I heard ibex moving across a scree slope on the opposite bank of the river however it turned out to be a family of three foxes working their way across the steep hillside before finally darting into a shallow cave. Once in the main valley the amount of shade reduced quite dramatically and the heat began to build. Luckily the path crosses a number of small river tributaries before reaching a path junction at Cueva Secreta a small natural shelter used as a bivouac spot by those going in to the higher mountains. I stopped for lunch at one of the many stream crossings and dipped my feet in the river in an effort to cool off. The temperature had now risen and according to the thermometer on my watch peaked at 45.1 degrees centigrade. Needless to say I beat as hasty retreat as possible to avoid the rest to the day’s heat. Mad dogs and Englishmen…….!!! 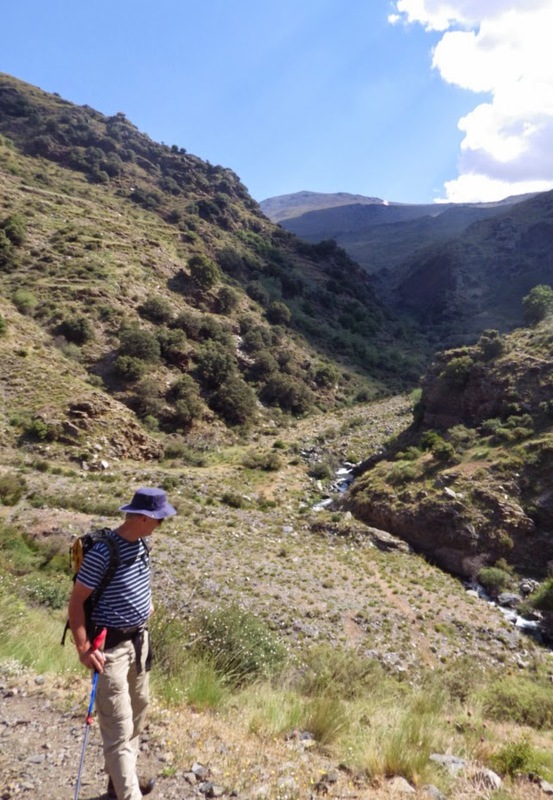 A recent walk up the Rio Poqueira was a delight, the Poqueira gorge in this area provides great shade in summer and this combined with the effect of the river itself leads to relatively cool walking even in mid summer. What also made this particular walk special was the return spring flowers en route. The middle section of the walk about three kilometres from the start in the now near deserted hamlet of Cebadilla passes though a very lush section as it passes above the river. This area lies at about 1700m and was full of spring flowers which have long gone from my area of the mountain. The flowers included varieties of purple orchids, forget-me-nots and some very nice specimens of broomrape, a parasitic plant with distinctive brown stems. Whilst not a rare plant these are not common and depend on a suitable host plant being in close proximity. After about an hour and a half in the cool of the valley the route climbs a steeply up to cortijo las Tomas at about 2,100m. Unfortunately this section is in full sun and at this time of year was extra hard work. We returned via an acequia on the west side of the valley leading to the Rio Veleta . The start of the acequia section is one of the few sections of what are known as ‘’protected path’’. A short section of the acequia has been cut through section of rocky outcrops and is quite exposed. This section is ‘’protected’’ by lengths of cable which , in theory at least can be used to safely cross this short section of path. To be honest one particular piece of cable is so loose that if you where unfortunate to slip and held on you would end up dangling some way down the rock face below the path. There are a couple more of the se sections of protected paths here in the Sierra Nevada. One lies just east the Refugio Carihuela south of Veleta whilst the other is on the ‘Verada Cortada’ in the Lanjaron Valley. Who owns the Sierra Nevada? I read recently on a UK walking web site that Blencathra, one of the Lake District’s best known peaks is up for sale. Blencathra, also known as Saddle Back lies just north of the main road in to Keswick from the motorway, so is easily accessible for many walkers and is seen by even more tourists as they drive into the ‘Lakes’ . At 868m it’s not the highest summit but it is popular nontheless and is perhaps best known for the short scramble across Sharp Edge en route to what is a fairly unremarkable summit. Sharp Edge is a short knife edge rock ridge which is now well polished due to the amount of traffic across it and when combined with a descent of Halls Fell ridge gives a great day out in the mountains. Seeing this news about the sale brought to mind a question I get asked by many clients, that is ‘’who owns the Sierra Nevada’’. I must admit I wasn’t really able to answer that question properly until recently when there was an article in the Spanish newspaperpaper Ideal. The overall area of the Sierra Nevada, which is made up both of the Parque Natural and Parque Nacional covers an area of 172,238 ha. The bulk of the land holding, some 100,389 ha is held in public ownership by organisations such as Ayuntamientos, the Junta de Andalucia as well as the Parque bodies themselves. The rest is in private ownership, mainly made up of farm holdings on the lower slopes of the range. The Sierra Nevada got its designation as Parque Nacional in 1999. Prior to that in 1986 it was designated as Biosphere Reserve and later in 1989 as a Parque Natural. The designation of the Parque Nacional meant that many changes occurred in the management of the mountains and it was at this time the famed high level road which once ran across the mountains from Capileira to the ski village above Granada was shut. The closure of the road began the return of the mountains to their natural state - a process which in the UK has been named ‘re wilding’. The road, open to traffic during the summer gave very easy access to the high mountains. So accessible was the area that the first Cicerone Press guide to the range describes an ascent of Mulhacen from a car park that existed in the Caldera area which lies at 3,000m at the foot of the west ridge of the mountain. Blencathra by the way is on the market for £1.75 million, a snip really when you consider you also get to hold the ancient feudal title of Lordship of the Manor of Threlkeld. Recently I was out with a large group and once again walked a favourite route of mine, the Ruta Medieval in the Taha area of the Alpujarra. Whilst I have done the walk many times it has to be said it is perhaps one of the best low level routes in the area. What makes the route special is a combination of stunning scenery and great walking with numerous things to stop and wonder at en route. The route does a circuit of the Rio Trevelez gorge as it runs from Trevelez south west toward Orgiva. Trevelez lies at 1,476m and claims the status as the highest village in Spain and is famous for its cured jamon. The gorge is steep sided and dramatic with high cliff faces above narrow ravines. The nature of the landscape means that there are no surfaced roads within the valley and the river only has three crossing places as it runs the 10km section within the Taha. At each of these crossings an ancient pack horse bridge spans the river where for centuries, mules and man have been able to safely cross. The bridge below the village of Fondales is known locally as the ‘’Roman bridge ‘‘ and whilst the current structure may not be from that period a crossing at this point must have existed for many years. The gorge here is only about ten meters across allowing a single arch to span the river about twenty meters below. Perhaps the most spectacular of the three crossings is the next one up stream which lies on the river between the villages of Ferreirola and Busquistar. Here the valley sides are particularly steep and paths on both sides of the valley take dramatic zig zags through near vertical terrain. On the south side in particular the path clings to the hill side as it climbs 250m vertically in about the same linear distance. So dramatic are these routes that they even have their own word in Spanish, ‘escarihuela’ like a ladder and their dramatic nature was commented on as far back as the Moorish period when the Arab poet Ibn-Aljathib described one example as a ‘’ path, of danger and martyrdom’’ whilst the Spanish writer Hurtado de Mendoza describes the area as ‘’harsh mountain: valleys leading to the abyss: mountains up to the sky: narrow paths: gullies and precipices with no escape’’. Even after all these years the drama of these routes is still there so if you only get chance to walk one route in the area this has to be the one. Today when walking along many paths in the Alpujarra and other areas we pass though olive, almond or citrus groves. Whilst these crops have been farmed for many years, in the past there used to also be a huge amount of cereal crops such as wheat , barley and oats grown across this region. Proof of this comes in a couple of ways. Many of the area’s river valleys contain the ruins of buildings which were obviously water-driven corn mills. In the Poqueira Gorge for instance there are about half a dozen ruined water mills down the length of the valley, once used to produce flour. Often these are found at key river crossings and at the junction of mule tracks once used to carry unmilled corn to the site and flour away to the villages of the area. Also evident higher up the hill sides are a large number of threshing circles. Known as ‘’Eras’’ these flat circular structures are often paved in the local stone and can be up to ten metres across. Eras are usually found on ridges or cols where the increased wind speed helped in the process of collecting the husks. They would have been used by local farmers to winnow the cut cereals and separate the wheat from the chaff. Here in Lanjaron there is an annual ’’ Fiesta de Parva’’ when the process of threshing is recreated. The process start when a strange cart like structure with wheels resembling circular saw blades is pulled around and around the era by a mule whilst a driver perches atop the cart. This chops up straw which is strewn across its surface. This cutting begins to break the seed husks off the stems and once tossed into the air, allows the lighter chaff to be blown away and heavier seed to fall back to ground to be collected for milling. Judging by the number of eras you see on some walks the amount of cereal produced in the area must have been huge. Within five minutes of my finca alone, there are three eras. Now apparently a protected structure, in the past they were generally seen as communal spaces which served a number of families. Another sign of this previous use of the land is the planting of olive and fruit trees along the terrace edges. Apparently the reasons for this was to allow a cereal crop to be grown down the middle of the terrace and still maintain viable fruit or olive crops. If. like me, your terrace walls are quite high this only seems to make the collection of olives even harder. Collecting olives from a four meter tree on top of a two meter terrace wall is not an easy process. Whilst reaching a height of 1,850m the Sierra de Lujar range to the south of the Sierra Nevada is generally overlooked by walkers visiting the area. Perhaps the reason is that with its whale bacl appearance and lack of rocky peaks it just does not appeal. There are routes here however with one of the better ascents forming a hard day out with about 1,200m of ascent. The route starts in the Baranco de Castilejo a steep sided valley due south of Orgiva. The baranco , which holds some single pitch climbs on outcrops , provides an easy route in as there is a mine access track running up it from the main road. The track splits at about 700m with the main branch doubling back to climb the western side of the valley to the mine workings above. Our route climbs the eastern side on a less well used track before reaching a fire break/track which runs south along the crest of a narrow ridge that climbs steeply upward. The track provides a clear route until about 1.000m where it reverts to a path running up the middle of the fire break which still follows the crest. The route now steepens and at 1250m begins to develop a more rocky nature with a number of limestone outcrops along the crest. The first three are by passed to the right (west) though provide short scrambles. After a further 300m of ascent the ridge fades into the main bulk of the mountain. From here you will see the masts at the summit, head due south to and these. Just before the first of the masts you will reach a narrow tarmac road, follow this past the first of the masts to bear right just before the second group to follow a stone path bearing right before the third group of masts. The path now narrows and heads west to cross the head of the Baranco de Castilejo and reaches a minor peak. Now narrower the path crosses open plateau to reach the edge of a one forest. From here head right (north) through the forest. As you emerge cross a distinctive limestone ridge to enter a second narrower band of older pine trees. Leave the second band of trees and head to a clear track still heading north across the hillside. As the track turns west continue north across virgin hillside to reach the head of a broad firebreak which creates the start of the descent route. Cross a number of narrow tracks until at about 1,250m you reach a well used track. There are some large caves off to the left (west).This now heads east to pass the ruins of some mine buildings before zigzagging down the mountainside back to the start of the route.